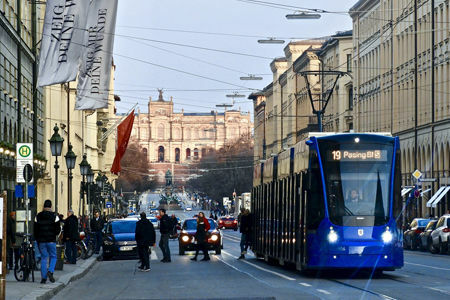 The metropolis of Munich is growing by approx. one percent of its population every year. In order to cover the housing demand, the city has implemented the urban development plan Munich North-East, with the goal of creating space for 30,000 residents and 10,000 jobs on an area of around 600 hectares. Mobility plays a decisive role in the development of a sustainable and city-friendly settlement concept. PTV Transport Consult develops integrated transport concepts that allow cities to meet their increasing mobility demands in an environmentally friendly and city-compatible manner. PTV Transport Consult’s planning experts were responsible for transport development planning. To this end, the development area had to be strongly aligned to sustainable means of transport and the existing road transport network was expanded as environmentally compatible and resource-saving as possible. Three development concepts were devised, which differed significantly in their design and focus. Their transport and mobility networks were also different from each other. In a final planning process, together with settlement, landscape and open space planning, integral implementation concepts were worked out, which took into account legal, infrastructural and temporal requirements.